This is a very affordable SG with nice upgrades such as the Min-ETune system. But is it a great guitar? No. Good value for money. Boost tones sound decent. Min-ETune included. Build quality and setup issues. Min-Etune went haywire. The modernist SG Futura is a bang-up-to-date 'economy' SG, and loads in pretty much all the gizmos Gibson has at its disposal. "The Futura begs the question: how can the company make guitars in the USA for this money?" At half the price of some of Gibson's other US SGs, the Futura, like many other low-end Gibsons, begs the question: how can the company make guitars in the USA for this money? It's amplified here when you consider the fitted Min-ETune system, that retails as a retrofit item for around £250. What is immediately obvious is a hastier build. 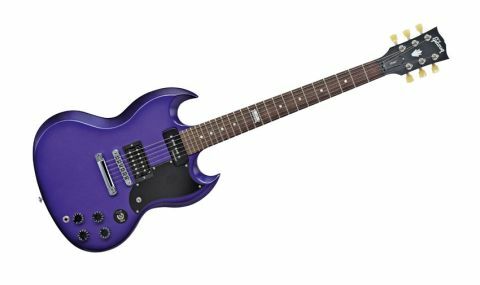 The purple finish looks like it's been applied with a brush - clearly, it's a quicker off-the-gun coating over a non-grain-filled mahogany body. Whereas the tips of the horns are sanded to softer, more rounded points on a traditional SG, here they're left square-edged and sharp. The neck is maple, not mahogany, with two additional frets and the edges of the neck, too, feel a little squarer than normal; the unbound edges are a little sharper, and there's no binding either - just dot inlays and the 12th-fret 120th Anniversary banner. The Futura gets a bigger Nashville-style bridge, an open-coil Burstbucker 3 at bridge, and a humbucking soapbar at the neck. With indented knobs, we have pull switch coil- splits on the volumes, while a two-position toggle switch on the pickguard introduces a 15db gain boost, with its battery hidden discreetly in the rear control cavity. Then, of course, there's the Min-ETune system mounted on the headstock, which does look a bit bulky from the rear - the individual motorised tuners' main housings are obviously larger than conventional tuners. The 'brain' sits between the two tuner rows and aside from housing the electronics, push buttons and display, it also has a removable and rechargeable battery. The Futura doesn't feel as good as it could. The pickup heights seem to have been set a little randomly, and while that probably won't bother a high-gain bedroom warrior, a little time tweaking the heights balances a little of the BB3's spiky edge with the apparent darkness of the neck pickup. While the DC resistance of the BB3 hints at hot PAF, the whopping 14.5k ohms of the neck pickup suggests a reason why it's so dark and soft-sounding; the coil-split drops it down to more P-90-like territory but then, unless you apply a boost, it's overshadowed by the bridge pickup. "Moving into the active world, suddenly we have clarity"
But - ah yes! - a boost: we have one of those. Moving into the active world, suddenly we have clarity, and although primarily conceived as a solo boost to drive your amp harder and lift you above the band for solos, actually having the boost on and then reducing the volumes and adjusting the tones to suit sounds a little classier, as far as that neck pickup is concerned. We've written about how the Min-ETune works and, yes, it does. While tuning up is okay where you might have drifted slightly, changing to an altered or open tuning not only requires more button-pushing, but we managed to completely confuse it - somehow - and stood back while it raised the D string to break pitch. Literally. Re-stringing isn't difficult: just remember the bass-side tuners work in the reverse direction. If we're honest, the Min-ETune's tuning isn't 100 per cent accurate when we checked our Peterson Strobe or TC PolyTune tuners, and while you can manually adjust the tuners, with their 40:1 ratio, they feel odd and take longer to turn and tune to pitch. The added weight changes the strapped on balance a little and, at least in the opinion of this writer, we wouldn't feel totally confident with the system for serious stage use. With Gibson's USA-made SGs starting at under £500 (see spec, right), you can't be surprised that in terms of fine details, instruments like this Futura seem a little lacking. And if we're honest, the voice of the neck pickup is odd, the BB3 veers on the too- bright side of the tone tracks and, sorry, but the Min-ETune just doesn't inspire stage confidence. That boost, however, could prove to be dead handy.